An Angelos Eletheriadis eighty-third-minute header earned Penrith only their fifth point of the season, as The Welfare continue their unbeaten start to 2019 after James Ellis gave the visitors a first half lead. 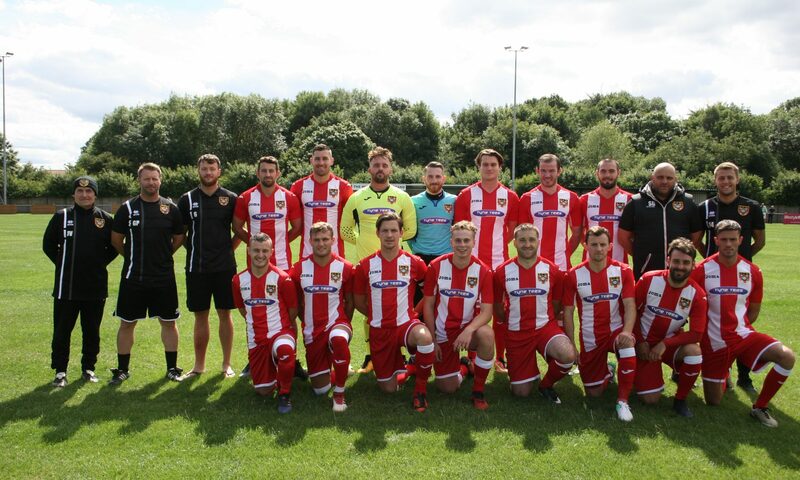 Speaking before the game, Ryhope Manager Gary Pearson insisted that he would not be taking anything for granted, in a game that on paper should have given his team a tenth win of the season. And he was right to be cautious as Penrith seemed nothing like a side chasing their first win in this campaign. It didn’t take too long for the first chance of the game to come, in fact both teams were pushing forward in the opening stages. When Michael Rae got hold of a loose ball in the Penrith 18 yard box on 4 minutes, he looked certain to score. He was unable to get full control of the ball before putting his shot wide. Ryhope came closer again on 22 minutes. A short corner to Robbie Bird was received back by James Ellis after taking the corner, he shot low from a tight angle and Keeper Flower could only scramble the ball just wide of the post. Penrith were not taking the pressure from the visitors lying down. They pulled themselves together and looked lively getting forward with several distance shots that Joe Atkinson was equal to. Just before the half hour, Adam Main was brought down on the edge of the 18 yard box and was awarded a freekick. Shaun Gardner stepped up and his shot was tipped over by Atkinson. The Ryhope keeper wasn’t to have much more involvement with the game, limping off a few minutes later to be replaced by Johnny Ball. Six minutes later Ryhope took the lead. Christopher Trewick cleared from a Penrith throw. Rae brought the ball down, knocking it to Trewick’s feet. A first touch pass through to James Ellis was perfectly timed and weighted for Ellis to take one touch past the Keeper and finished in the empty net from a tight angle. From then Penrith had more fight in them. They were able to win a couple of corners with no end product. Then into stoppage time, Ryhope’s hearts were in mouths as form their seventh corner of the game Adam Robley found himself unmarked in the six-yard box with an open goal to aim at. His header came back off the crossbar, bouncing against keeper Ball’s knee and finally rolling out for a throw. That would end the half with Ryhope clinging onto their goal advantage. Penrith came out for the second half rejuvenated and were the most forceful of the two teams going forward. However, they could only inflict long shots at the goal, just like Atkinson in the first half Ball was more than a match for anything falling around the six-yard box. Carl Jones and Danni Lay, supported by Trewick were proving very tough to break down. Five minutes into the half Ryhope had a golden chance to double their lead. Ellis and Trewick allowed Penrith to have no time on the ball, forcing them into hurried sloppy passes. Trewick picked up on a loose pass, laying it back to Jack Walker, he delivered a pinpoint pass forward for Rae to flick on. Bird beat the offside trap, taking it past the challenge of a defender and one on one with the keeper. He couldn’t fully control the back and only managed a tame shot that rebounded of the Flower’s chest and into his hands. Neither team looked like scoring. Both midfields and defences remained resolute and stamped out any attach that started to build. A Skidmore freekick just after the hour was delivered to the far post, Carl Jones was closest to getting on the end of it, however it was past everyone and out for a goal kick. Penrith were seeing more of the possession and attacking territory. Their efforts were rewarded with only eight minutes remaining in the game. The home team won a corner after some tired defending at the back for Ryhope. Having missed an open goal in the first half Robley would have been pleased to be taking the corner as Penrith filled the six-yard box. Robley delivered and Angelos Eletheriadis climbed the highest to head home. Both teams were now in search of a winner, Ellis coming closer in the final minutes. A timely ball forward by Rae fell into the path of Robbie Bird. He as able to cross on the edge of the six-yard box where, under pressure from two defenders, Ellis could only place a shot wide of the goal. Penrith then had their chance. An uncharacteristic sloppy clearance from Carl Jones rebounded and fell to Martyn Coleman. Coleman was brought down under Jone’s recovery tackle and Penrith were awarded a free kick 3 years out the box. Coleman stepped up and blasted a shot against the wall. That would be the last action of the game as referee Shane Sugdon blew. A well-earned point for the home team who must feel they could have come away with all three points after a very spirited and driven performance. “I’m obviously disappointed not to come away with three points, but saying that I don’t think we deserved three points. It was a hard-fought battel, I’ll take nothing away from Penrith.